Background De-novo diabetes mellitus is an important consequence of distal pancreatectomy, and a better understanding of the frequency and risk factors for this outcome may allow alteration of the treatment course. 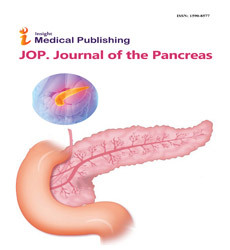 The aim of this study was to define the relationship between the volume of pancreas resected and the development of pancreatic endocrine dysfunction following distal pancreatectomy. Patients and Methods We interrogated our prospectively-maintained pancreatic resection database to identify patients who underwent distal pancreatectomy from 2005 through 2015. Data on perioperative endocrine function, histopathology, demographics and pancreas resection volume were extracted and analyzed. Results 317 patients underwent distal pancreatectomy between 2005 and 2015. The incidence of de-novo diabetes mellitus was 14.7% (n=34). A high baseline body mass index was associated with development of diabetes mellitus (P = 0.017). However, neither patient demographics, the underlying pathology nor the volume of resected pancreas predicted the development of new onset diabetes mellitus. Conclusions De-novo diabetes mellitus is common following distal pancreatectomy regardless of resection volume or histopathological diagnosis. The presence of a high pre-operative body mass index is a statistically significant risk factor for developing de-novo post-operative diabetes mellitus and this is important for the consent process.